Andrés has been nominated for the Nobel Peace Prize for his disaster relief efforts in Puerto Rico, Haiti, California and all over the world. For many years, chef José Andrés, the culinary mastermind behind the Michelin-starred minibar restaurant, was known as the authority on Spanish food in the U.S. But now, he's being recognized for a different achievement: his relentless and consistent disaster relief work. 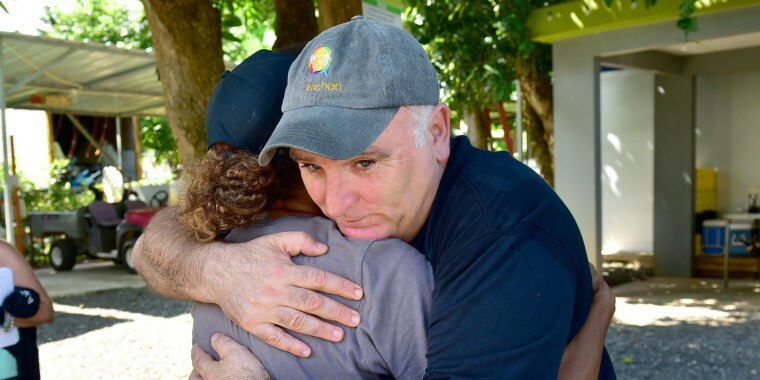 Through his organization World Central Kitchen, which he founded in 2010 after Haiti's devastating earthquake, Andrés has reportedly served more than 3 million meals to those displaced in Puerto Rico by Hurricane Maria, which is nearly double the amount of meals the American Red Cross has served on the island since the deadly event. The chef's work in Puerto Rico, as well as in other devastated areas, has earned him a nomination for the Nobel Peace Prize for 2019, the Washington Post has confirmed. If Andrés wins, he would be the first chef to receive the prestigious prize. This year, there are approximately 300 nominees so the competition is steep. "Because of Mr. Andrés’s work, millions of people have been fed. This is the most basic human need and Mr. Andrés has proven to be world-class in this essential humanitarian field. With an incredible spirit and an innovative mind, Mr. Andrés is solving one of the world’s ancient problems and supplying world leaders with a new road map to provide more effective disaster relief in the future." "Oh, wow," Andrés told the Washington Post, in his characteristically humble manner, when reached for comment on Tuesday. "They nominate everybody." Once he had time to process the news, the chef said the nomination just reinforced how important a role food plays in public policy, particularly immigration, as so many immigrants from Central America run restaurant kitchens in the U.S.
"In the end," he said, "you see that food every day is having a bigger impact." Spanish-born Andrés and his wife both became U.S. citizens in 2013 after 23 years in the country. More recently, he took his humanitarian efforts to California to provide meals for those displaced by California's catastrophic wildfires. On Thanksgiving, he was joined by Guy Fieri and Tyler Florence to feed 15,000 victims of the deadly Camp Fire. Over the last eight years, World Central Kitchen has also shown up for disaster-stricken places like Florida, Guatemala, North Carolina and Texas. Because of this, in February, the James Beard Foundation named Andrés its 2018 Humanitarian of the Year. And yet, on Twitter, which he essentially treats as his disaster-relief diary, the legendary chef-turned-activist continued to downplay his nomination because, well, it's José Andrés.